Of all the desserts you could have in winter, I think Carla and I may have a favorite that's not very wintery at all. I originally found this recipe back in 2005 in the sadly, now-defunct Gourmet Magazine. It's a great dessert, that while sounding odd, has surprisingly wide appeal, and is a great way to eat through that box of pears you get at Christmas. It's simple: pears, ricotta, and honey, all in generous proportions. Plus some herbs. 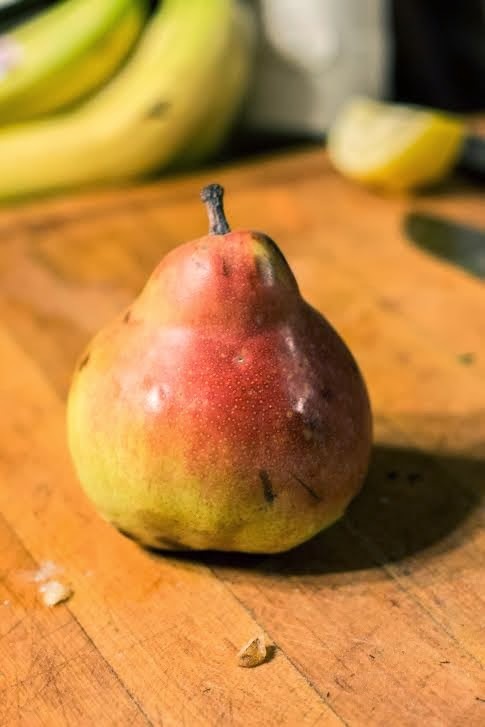 Slice a pear in half and take out that fiddly little fibrous stem and the seeds. I like to slice my pear thinly and fan them out, but you could easily skip that. 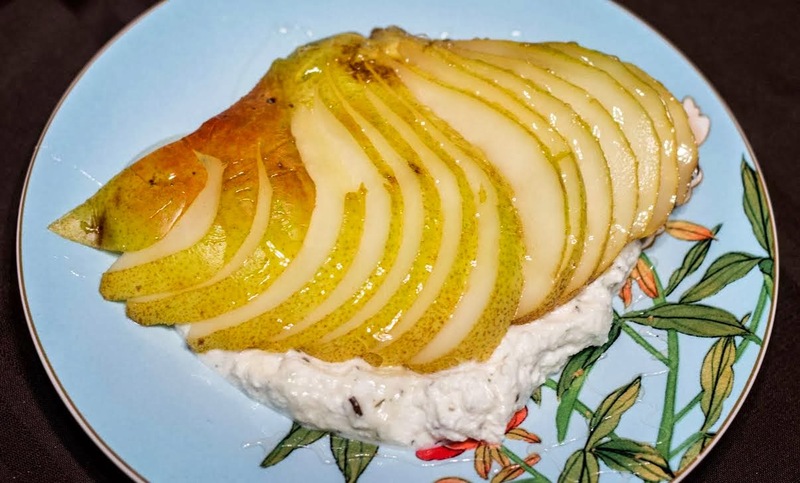 Or if you pears are ripe enough, you could probably just spoon their flesh out when serving. Then take some ricotta and add a small amount of fresh mint, thyme, and rosemary. This addition of herbs is what people find particularly odd, as it sounds like a ravioli filling. But the mint should be only a few teaspoons, and just a few small flecks of fresh rosemary and thyme. They add a delicate little herbal interest on the palate, but never dominate the dish. After the pear is sliced, lay down a good scoop of the herbed ricotta on each plate, top with half of a pear, and drizzle with honey. This is when I like to push out the pear slices into a fan, so the honey can work in between the slices and the ricotta really sticks to the soft, slightly-mealy flesh of the pear. Plus, the ricotta acts as a sponge to collect the juices dripping from the pear. As you eat it, the pear breaks up and mixes with the ricotta even more, making your last bites a perfect mix of pear, cheese, and sweet, sticky honey holding it all together. I've wanted to write about this dish for a while, but it kept getting forgotten, and then winter would pass and the pears would go away. As with any dish, but particularly one this simple, top quality ingredients are key. You don't want to use a rock hard, out-of-season, imported pear, and then grab that leftover ricotta from the back of the fridge that's picked up a slightly "extra cheesy smell." Everything should be fresh, clean, and delicate. Fruit, cream, and honey.